If you've always wished you could draw objects in 3D, there's a pen that uses basic 3D-printing technology to let you draw wire art-style objects, and it's looking for a little crowdfunding. So is a documentary on the power of the Batman story, an RPG setting that places cosmic horrors in WWII, the print volume of one of the Internet's most ludicrous webcomics, and a Creative Commons concept art book that lets you collaborate on the story. Achtung! 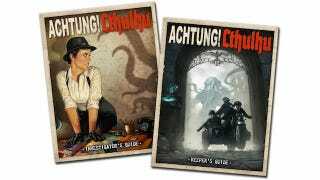 Cthulhu - The WW2 Keeper's & Investigator's Guides: If you've been looking to add Nazis to your Lovecraftian RPG, take a gander at Achtung! Cthulhu. The World War II setting is designed to be compatible with the Call of Cthulhu and Savage Worlds RPGs, adding the battle between Axis and Allied forces to the normal nefarious evils. You can receive PDF and printed versions of various planned supplements at various levels, grabbing PDFs of the Keeper's Guide and Investigator's Guide at the $20 level. SYMBIOSIS: A Creative Commons art book by Steven Sanders: We're big believers in the power of artwork to inspire great writing, and Steven Sanders' art book Symbiosis looks like a great place for writers—especially those interested in copyleft collaboration—to find inspiration. Symbiosis is filled with designs and visuals for a 1940s-esque world in which biotechnology and mechanical technology are inextricably linked. The book is licensed under a Creative Commons Attribution-Noncommercial-ShareAlike 3.0 Unported license, meaning that you can create and publish your own stories incorporating Sanders' artwork. For a $10 pledge, you'll receive a PDF of the book.